This week's Illustration Friday theme is 'ripple'. It comes from illustrator Kelly Light, who has set up the Ripple project to raise funds for wildlife affected by the Gulf oil spill. The artworks are each available for a $10 donation, which will go to either The Institute for Marine Mammal Studies or The International Bird Rescue Research Center. 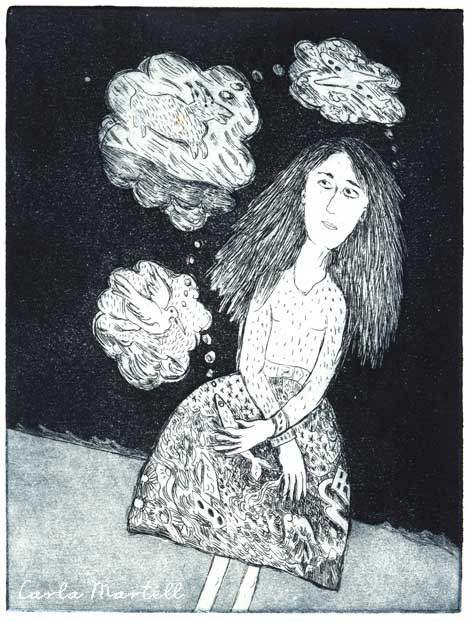 Here's what I'm donating - it's an etching I did a while back, but it seemed to fit the theme. I like the idea that little acts from a lot of people can add up to make a big difference. You can see all the work, submit your own, or make a donation here, at the Ripple blog. Carla, thank you so much for the etching - I absolutely love it - in particular I love the intricacy. And you are right, it does fit the theme. You might like to know that the charity which benefited from your etching is The Institute for Marine Mammal Studies.